Been diving in Mini Wall? Please Vote! This is a fantastic dive for divers who do not want to dive with current. It is a nice and easy dive and has some interesting topography features for an interesting dive. The site is made up of a sheer wall that drops down beyond 40 metres but also has a plateau area within the site. The dive site as mentioned goes all the way down to 40 metres but most divers will find that the hover around 25 metres where the majority of the reef features are along the plateau. The dive eventually leads to a sandy bottom that slopes up to the main beach. The currents here are normally only mild and all level of divers can access this dive site as it is a relatively calm dive to complete. 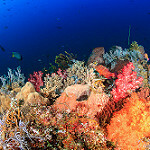 Divers can expect to see the normal Komodo marine life especially along the plateau area where there are many sweetlips, batfish, butterflyfish, parrotfish, anthias, damselfish, and other fish swimming around. Divers should be able to see spotted eagle rays and manta rays swimming around the reef as well. The wall has many caves and holes and these are home to a variety of smaller marine life including a number of giant spiny lobster. 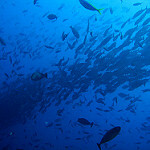 They will also host nudibranchs, crabs, other types of lobsters, shrimps, and other smaller critters and crustaceans. Divers can often spot crocodile flathead fish as well. Map of Komodo, Mini Wall dive site.